When I was in high school, I read the book Black Like Me by John Howard Griffin . The book is a true story of a white man who decided he wanted to see what it was like to live as a black man in the South in the early 1960’s. He would enter shops or apply for a job as a white man one day, then come back the next day as a black man, with skin dyed, but everything else the same, and note how differently he was treated. The book had a profound affect on me. A white girl growing up in Whitefish Bay, I entered high school never having had a black friend, or for that matter, without even having had a conversation with a black person. Black Like Me made me think about the fact I was white—something I had never given much thought to before. And in thinking about being white, I also began to wonder what it would be like to be black. For the several weeks it took me to read, and then re-read the book, I found myself walking around the halls of Dominican High School, imagining that my skin was brown rather than white and that my hair was dark and tightly braided, instead of blondish-brown and long and wavy. I imagined myself with the strong muscular arms and legs of a sprinter rather than with my own skinny long-distance frame. I looked at my tight-knit group of friends and wondered if I would be as close to them if I were black, and I looked at some of the black kids I didn’t know and wondered if we’d hang out together if I weren’t white. Looking back at my 1985-self from my current vantage point— I believe now that even as a 15-year-old, God was at work in my life, helping me to begin to build perspective that I would need to someday become the mother of two daughters of color. Jamie, our adopted five-year-old is of Puerto Rican descent and has tan skin with a rosy undertone. Teenasia, our seven-year-old foster daughter is African American and has skin the color of coffee without cream. The entrance of these two girls into our family have helped me to once again walk around, as I did in high school, with an eye for the color of those around me. In mothering these two girls, I’ve noticed that the expression being “colorblind” when used to explain that someone is not judging someone based on their skin color, is an expression used almost exclusively by white people. If you are black (or light brown or tan)-- or are the parent of someone who is one of these shades, you immediately realize that you are never colorblind. I am always noticing color. I understand that no harm is meant by the phrase, but it doesn’t speak to the fact that there is still tremendous disparity in our nation between whites and those of color. For those who aren’t peach, color does still matter. While we’d like to think that our TV shows, our ads, our toys and books represent all children, my experience is that while I consistently see children the color of my white sons and frequently see children pictured who are the color of Jamie, I rarely see kids in newspaper ads or on TV who are the color of Teenasia. The message seems to be that white and light brown is fine, but dark brown-- not so much. And Teenasia is noticing. We have several picture books with black girls as main characters. Upon starting one of these books, T almost always exclaims, “She looks like me!” before we start reading. In reality, the girl doesn’t look like Teenasia any more than a picture of a random white woman would look like me, but Teenasia is so happy to see anyone of her color, with her hair and her style of features, that she focuses on these similarities. While our family makes an effort to involve the girls in activities that draw a multicultural crowd—African dance; ethnic festivals; belonging to a diverse church—some of our interests as a family nevertheless highlight areas where the color barrier is yet to be broken. 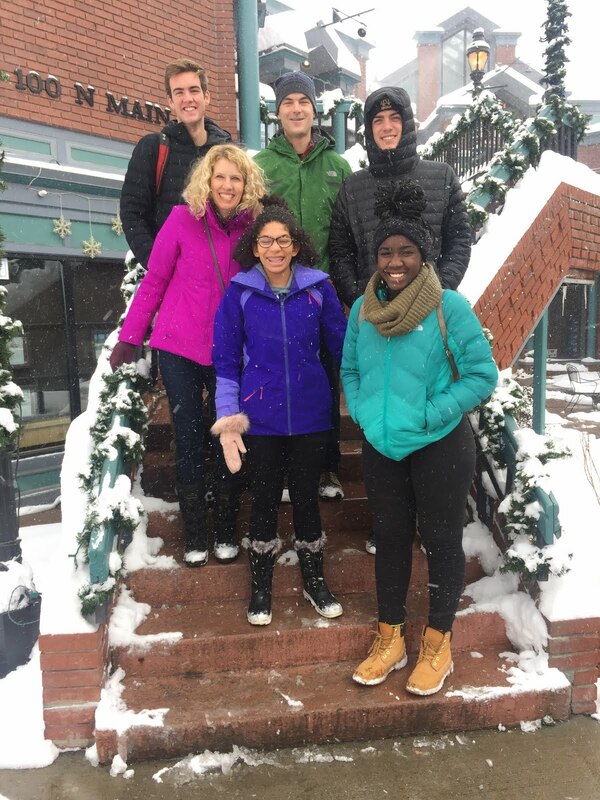 On a recent ski trip, for example, Teenasia and Jamie were the only minorities I saw on the slopes in two days. The same thing was true for the state park where we camped this summer. While Disney seems to offer a princess for every occasion, none of them are black, and only Pocahontas could even be described as light brown—and really, she’s not even a princess. But if having daughters of color has opened (or re-opened) my eyes to some negatives in terms of how children of color may still be marginalized, being a mother to T and Jamie has also allowed me to see the beautiful bridges that can form across cultures and color. I have been privileged to witness both black people and white people reaching out to my girls with special interest because of their foster care background. I have been welcomed into the African American community by black women seeking to teach me about skin and hair care for girls of color. Countless times, Bill and I have heard people remark on what a beautiful family we have. No one has ever made us feel we were somehow less qualified to parent Jamie or T because we were not the same color. And perhaps the best compliment I’ve ever received came from Marina, an African American friend who also has a child at St. Monica School. We were on the phone and she was making a point about the needs and thoughts of other black parents at the school. “And when I say other black parents, you know I’m including you, right?” she asked. Black Like Me. Black like my friend Marina. Black like Teenasia. I thank God for preparing me well.